The new Baku Port will play an important role in strengthening Azerbaijan's transport potential, Azerbaijani President Ilham Aliyev said. He made the remarks at the opening ceremony of the Baku International Sea Trade Port Complex in Alat settlement on May 14. "Today is a very significant day in the life of our country. The Baku International Sea Trade Port is being put into operation," President Aliyev said. "I sincerely congratulate Azerbaijani people on this wonderful event. I am confident that the new Baku Port will play an important role in strengthening the transport potential of our country. I made the decision to build the Port several years ago. I knew, and I saw that Azerbaijan will have a major transport, transit potential, that our country will develop rapidly. The made decision showed that our policy is far-sighted, weighted," the head of state said. President Ilham Aliyev said that construction work, which was divided into stages, has been launched. "In 2014, the ferry terminal was commissioned, and Ro-Ro terminal - was commissioned earlier this year. And today, the Port is fully ready for operation. The Port that is capable of handling 15 million tons of cargo, including 100,000 containers, will undoubtedly play an important role in strengthening our transport infrastructure," he said. The head of the state emphasized that the next stage stipulates ensuring that capacity for cargo transshipment is brought up to 25 million tons. "Plans related to expansion work have been voiced during today's presentation, and it is planned to increase the port's capacity to 500,000 containers a year," the head of state said. President Aliyev further noted that local and foreign specialists and employees participated in the port's construction. "I would like to express my gratitude to them for the work done. I personally controlled the construction work. I am glad that today the highest standards are applied here, all equipment, necessary technical means, latest cranes were purchased and installed here. Thus, we established the strongest transport and logistics center in Azerbaijan," he said. Choosing Alat also was not accidental, President Aliyev added. "The existing Baku Port no longer meets our needs, it is located in the city center and its ability to handle increasing cargo volumes is very limited. Alat is a very favorable place from the geographical point of view, and routes passing Alat in both the western and southern directions, including roads and railways, undoubtedly played a major role in choosing this place Surely, development of the Alat settlement will depend, to a large extent, on the logistics and transport infrastructure created here," said the president. He added that in the near future a free economic zone will be established in Alat, and in the future this territory of Baku will develop very rapidly, numerous workplaces will be created. "Thus, Alat will take an important place in development of the country's transport and economic potential, " Ilham Aliyev said. 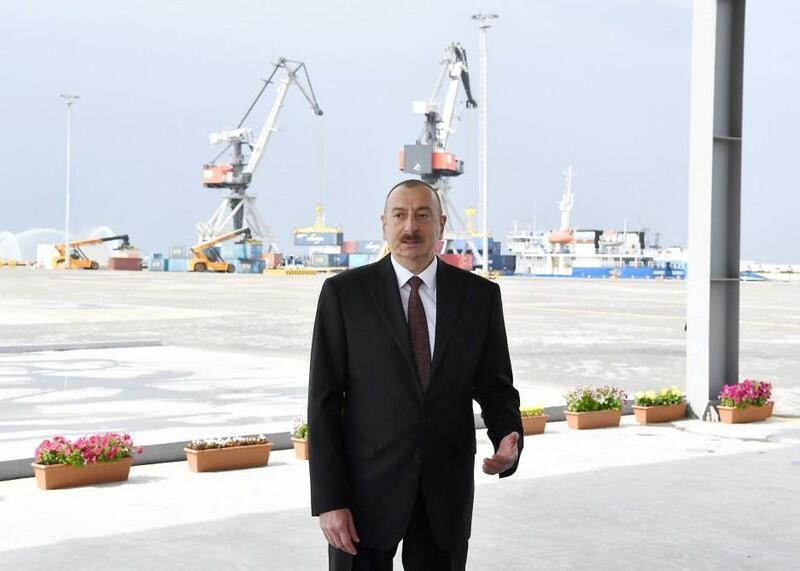 President Aliyev further said that the commissioning of the Baku International Sea Trade Port gives ground to say that all tasks set before the country's transport infrastructure have been fulfilled. "To date, huge work has been done in this direction. We have the biggest flotilla in the Caspian Sea, we have more than 260 vessels. According to information provided to me, 18 ships were purchased over the past few years. A shipyard was built in Baku upon my initiative. We can build, manufacture all types of ships and, thus, we have eliminated dependence on foreign partners," the head of state said. President Aliyev added that over the past 15 years,15,000 kilometers of highways have been built in the country. "Roads leading to our borders with all neighboring states were put into operation, intercity and rural roads were built, that is, this infrastructure was created. Over the years, seven airports were built. Six of them are international airports. Azerbaijan has the most modern aircraft fleet. Recently, the Heydar Aliyev International Airport received a five-star status. Just for information I would like to say that only nine airports in the world have a five-star status, one of which is the Heydar Aliyev Airport," President Aliyev said. The president further noted the work done to upgrade the railway infrastructure. "We are modernizing the railway infrastructure, updating the existing railways, that is, railways are being built to increase the speed. Locomotives and wagons are being purchased. Last October, the Baku-Tbilisi-Kars railway was commissioned on this territory. That was a historic project. Azerbaijan, which issued huge funds for the implementation of the project, was its initiator. We linked Baku and Europe with the help of railways. Indeed, Azerbaijan linked Asia and Europe. From now on, this transport corridor will yield great incomes for many years, bring great benefits to our people," the head of state added. President Aliyev emphasized that the Baku-Tbilisi-Kars railway is a historic project. "Thanks to the successful implementation of this project, Azerbaijan will further strengthen its position in this region," he noted. "We are currently working on creation of the North-South Transport Corridor and we have completed all the necessary work in our territory. Thus, the routes going from north to south and from east to west pass and will pass through the territory of Azerbaijan. We have allocated additional funds to complete the North-South Transport Corridor, and I am sure this railway will be put into operation in the next few years. Thus, Azerbaijan, which has no access to open seas in Eurasia, will become a transport and logistics hub. We already see this, we are already fulfilling this function," he said. "One might think that we could consider the work already completed. But we should look and we look to the future. Presently, we are engaged in launching the South-West Transport Corridor. This is also a very important transport corridor, and according to the information provided to me, the first test train has already been sent on that route. Thus, creating a big transport infrastructure, we multiply the geo-political, geo-economic importance of Azerbaijan," President Aliyev said. President Aliyev further stressed that, at the same time, these projects expand and strengthen the international cooperation. "If we look at the number and power of the countries participating in the East-West and North-South transport corridors, we will see that this is indeed a format for large-scale international cooperation. The East-West Transport Corridor connects China, Kazakhstan, Azerbaijan, Georgia, Turkey and further the countries of Europe. The North-South Transport Corridor connects Pakistan, India, Iran, Azerbaijan, Russia, the countries of Northern Europe. And the South-West corridor connects countries in a wider format," President Aliyev said, adding that Azerbaijan is a country that participates in all these projects. Azerbaijan made a lot of efforts to implement these projects, major political steps were taken in this regard, President Aliyev said. "That is, we purposefully, thoughtfully worked, we made efforts to implement these projects. Finally, we saw the result. Once again, I would like to say that the implementation of these projects will bring economic benefits not only to us. We, by making the most efficient use of our transport potential, will significantly improve our economic situation. These projects greatly enhance Azerbaijan's geopolitical significance," he said. The president stressed that Azerbaijan, as an indispensable country for the regional cooperation in Eurasia, will continue its activities. "We enjoy great respect in the world. Azerbaijan is known as a very reliable partner, a country capable of much. Our growing economic power allows us to realize such historic projects. The construction of the Baku International Sea Trade Port is one of the important projects implemented through the state budget of Azerbaijan, and this day will be remembered as an important day in our history. I once again welcome all the participants of the construction of this port, I express my gratitude to them. I wish you continued success in your future work. Once again, I congratulate you and all Azerbaijani people on this wonderful event. Thank you," the head of state concluded.